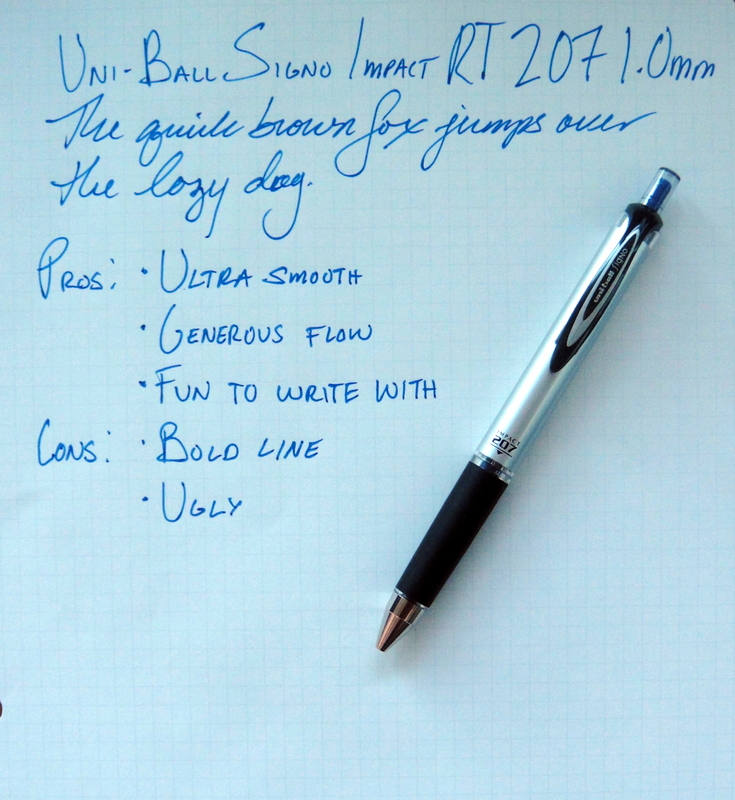 The Uni-Ball Signo Impact RT 207 is a retractable gel ink pen with a bold 1.0mm tip. I have been writing with this pen for a day now and line width is too wide for me and I don’t have small handwriting. The ink really flows out of this pen creating an ultra smooth writing experience. It’s actually a fun pen to write with even though I wouldn’t use it for work. The ink drys very quickly which is surprising for a gel ink pen with such a bold line. The design isn’t overly cohesive; it has a silver barrel with a black rubberized grip, a translucent click button with blue plastic inside, and a metal tip. It’s almost as if this pen with made from Uni’s spare parts bin. I don’t have a use for this pen and it is a bit ugly but I do find it fun to use. I am not sure I would recommend this pen. The quality like all the pens in Uni’s Signo line is great but unless you need a really bold line you would likely be happier with a narrower Signo. In general I like the Signo 207, but I’d be hard pressed to choose which size I would like and use.